Roosevelt began his campaign in October. The most memorable moment of the campaign came when the Republicans attacked Roosevelt for using a Navy destroyer to retrieve his dog, who was left behind in the Aleutian Islands. Roosevelt responded by saying: "These Republican leaders have not been content with attacks on me, or my wife, or on my sons. No, not content with that, they now include my little dog, Fala. Well, of course, I don't resent attacks and my family doesn't resent attacks, but Fala does resent them." His speech galvanized Roosevelt supporters. Roosevelt campaigned vigorously to show he was still up to the job. 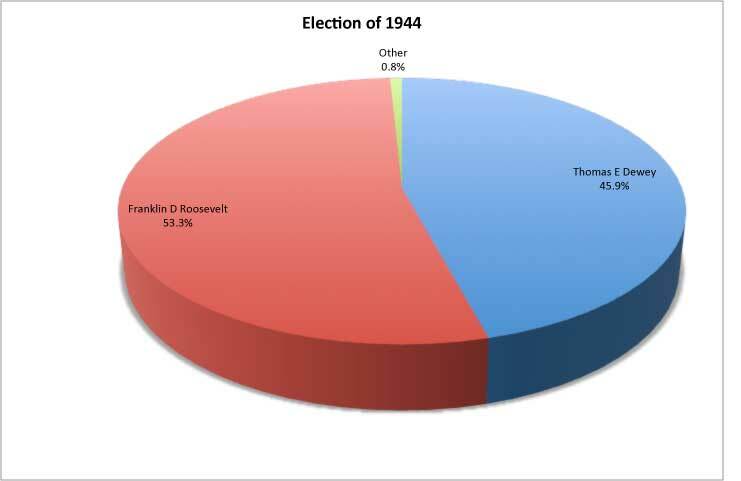 The 1944 election was the closest one for Roosevelt. However, once again, he won. In the midst of the war, there was no question that Roosevelt would be renominated. Though Vice President Wallace had become quite unpopular in the Democratic party. 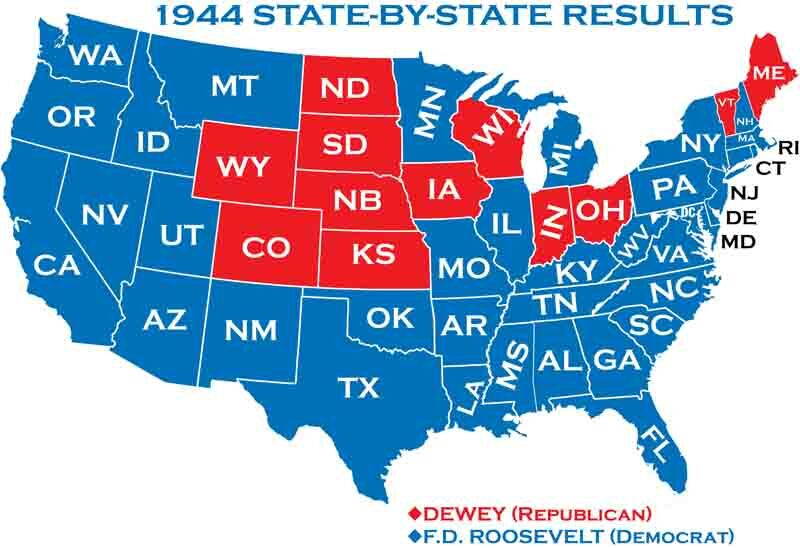 As a result, President Roosevelt was forced to replace Henry Wallace with Senator Harry Truman as his 1944 vice presidential running mate. The Republicans nominated Thomas Dewey at the their convention in Chicago. For the first time the Republican platform totally abandoned its traditional opposition to involvement in foreign treaties. It supported the United States’ participation in post war organizations. 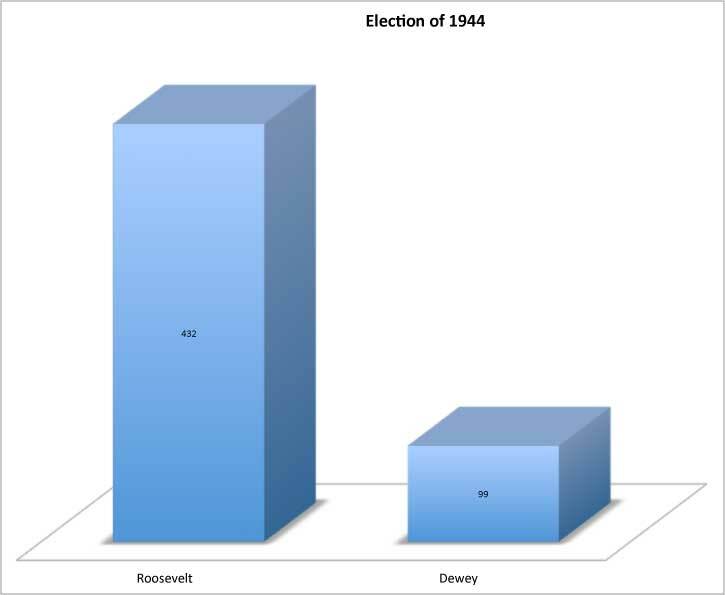 With a war going on, Dewey did not attack the Roosevelt’s policies. On the other hand, he indirectly questioned President Roosevelt’s abilities to continue, by continually referring to FDR as the "tired old man."